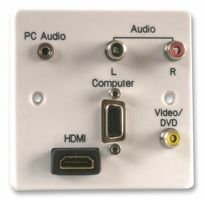 Flush mount steel wall plate / faceplate with a 15 pin VGA female connection and a 3.5mm stereo socket for devices such as monitors and projectors. 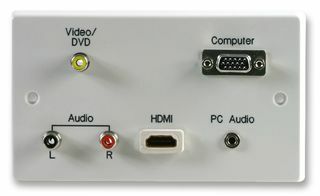 Flush mount steel wallplate with 2 x 15 pin VGA female connections for devices such as monitors and projectors. 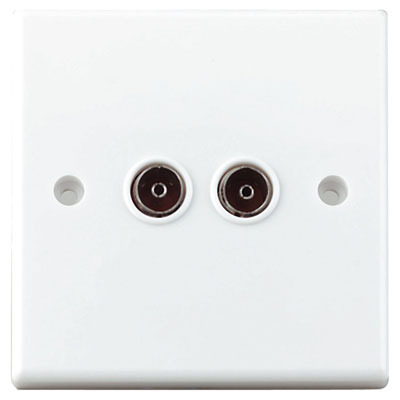 Flush mount steel wall plate / faceplate with a composite video RCA phono socket, a 15 pin VGA female socket for devices such as monitors and projectors, a 3.5mm stereo audio jack socket & a pair of RCA phono sockets for stereo audio signals. 122.331UK - STEEL AV BREAKOUT BOX WALLPLATES WITH 2 x Faceplate 4 Pole Speakon Type Speaker Connectors. 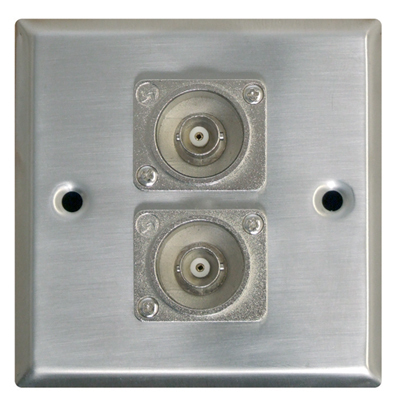 We have a range of quality stainless steel AV wall-plates fitted with 2 x speaker socket connectors. 2 x HDMI STEEL BREAKOUT BOX WALLPLATE / FACEPLATE IN WHITE. CAT5e RJ-45 KEYSTONE FACEPLATES. Shuttered RJ-45 faceplates with twin outlets for network applications. CAT5e RJ-45 KEYSTONE FACEPLATES. Shuttered RJ-45 faceplates with single outlets for network applications. Single Socket Size HDMI Wall Plate Outlet with Female to Female Connector. 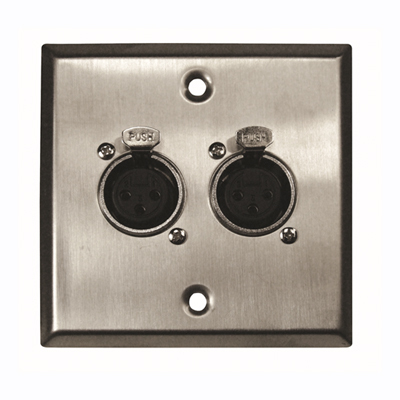 F267XC Silver Metal AV Wall Plate With 2x XLR Sockets. Standard Size. 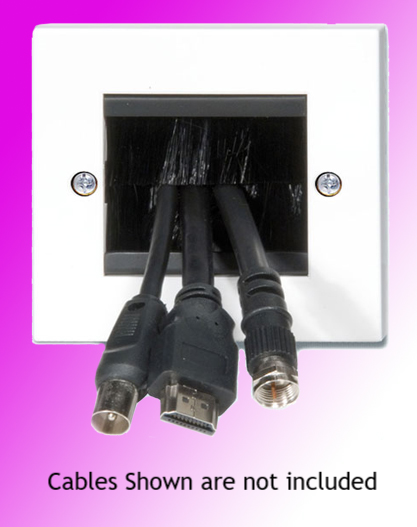 Metal A/V wall plate featuring 2x XLR Sockets. Standard Wall Plate size. 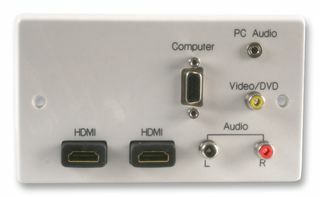 A metal AV Wall Plate with 2x 3 Pin XLR Connectors. Stainless steel. Please note the faceplate change front depending on which fitting is supplied at the time see Pictures. 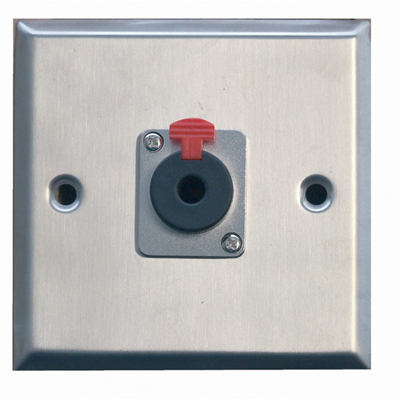 F267XF Silver Metal AV Wall Plate With 1x 6.35mm Stereo Jack Socket. 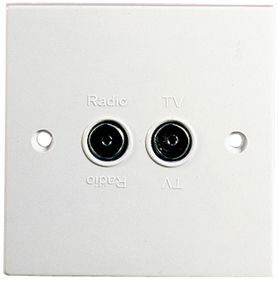 Metal A/V wall plate featuring 1 x 6.35mm Stereo Jack Socket. Standard Wall Plate size. 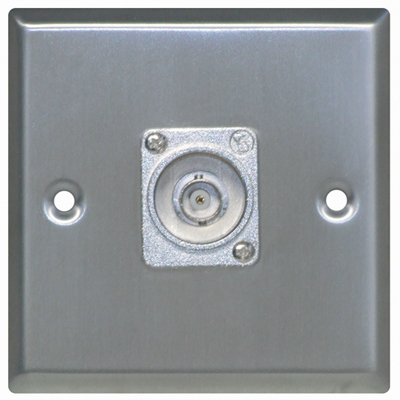 F267XF is a quality silver metal AV Wall Plate With 1x 6.35mm Jack Socket. F267XG Silver Metal AV Wall Plate With 2x 6.35mm Jack Sockets. 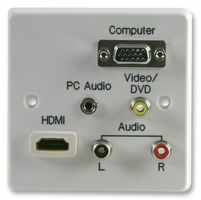 Metal A/V wall plate featuring 2 x 6.35mm Jack Sockets. Standard Wall Plate size. 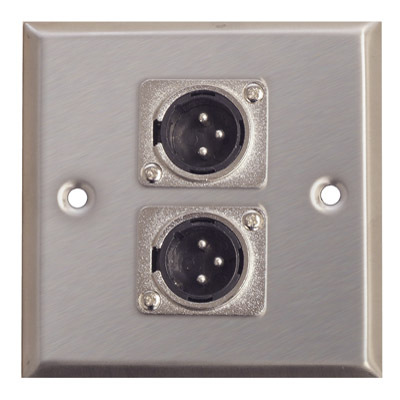 F267XG is a quality silver metal AV Wall Plate With 2x 6.35mm Jack Sockets. F267XJ Silver Metal AV Wall Plate With 1x BNC Socket. F267XJ Silver Metal AV Wall Plate With 1x BNC Socket. 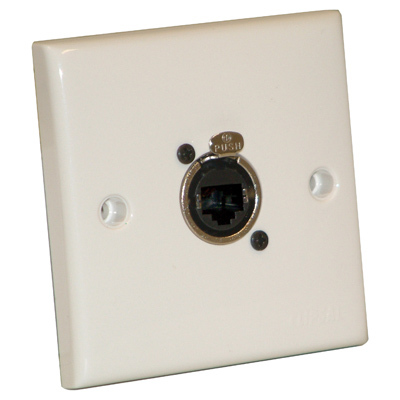 Metal A/V wall plate featuring 1 x BNC Socket. Standard Wall Plate size. F267XK Silver Metal AV Wall Plate With 2x BNC Sockets. F267XK Silver Metal AV Wall Plate With 2x BNC Sockets. 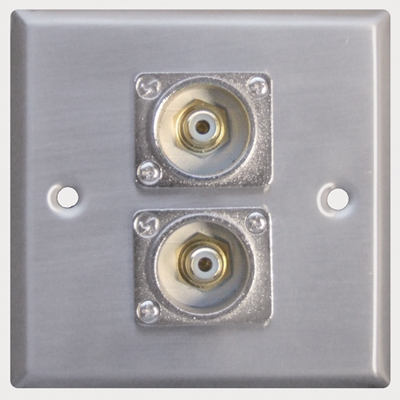 Metal A/V wall plate featuring 2 x BNC Socket. Standard Wall Plate size. F267XM Silver Metal AV Wall Plate With 2x Phono Sockets. 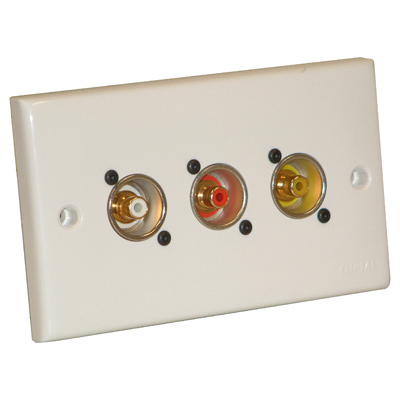 White Single Flush Or Surface Mounting Signal Outlet Plate Fitted With Neutrik Ethercon Socket. Pluglock is a uniquely designed product to secure 13A plugs into standard sockets to prevent them being removed by accident. BLACK PROSIGNAL PSG03855 FACE PLATE / WALLPLATE, XLR PLUG + 1/4" AUDIO JACK SOCKET. Flush mount steel wallplate with left and right spring terminals for connection of a single speaker. Perfect for audio visual installations. Bulk purchase discounts available on this item. Flush mount steel wallplate with left and right spring terminals for connection of a pair of speakers. Perfect for audio visual installations. Bulk purchase discounts available on this item.